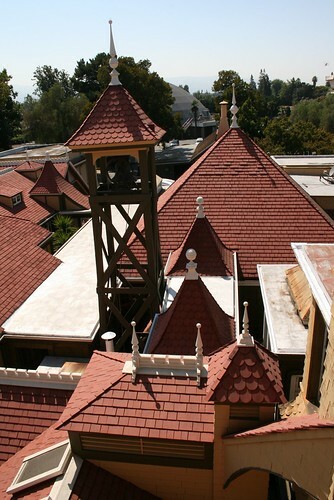 Yesterday, we went to see the Winchester Mystery House. It is a house in San Jose, CA. And it is very interesting because of its oddity. 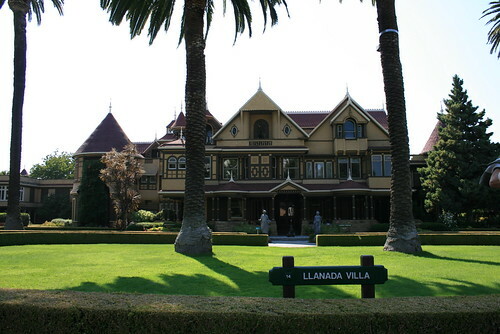 Mrs. Winchester owned the house, and she has an unusual story, and so does the house. Mr. Winchester was the president of the Winchester gun company (not exactly the right name of the company, but whatever). The company made a very popular gun in the wild wild west and was a very good seller. So Mr. Winchester made a lot of money. He married Mrs. Winchester and they lived on the east coast. They had a child, but it died early on of a rare disease when the child was only 6 weeks old! Then, not long after, Mr. Winchester died as well. His wife was left all alone, and inherited all of the company and its wealth. But she was so depressed, and it got to her head. She was a superstitious woman so she felt as though she was cursed. She want to go see a oracle, or medium, whatever you want to call it, and the man told her she was being cursed by all of the spirits that had been killed by the gun that made her family so rich. The oracle instructed her to appease the spirits. The only way she could do that was to move west, and to begin construction on a house which would never be completed. So thats what she did. She moved to San Jose CA, bought an old farmhouse and began renovating it. The renovations never stopped for as long as she lived, 24 hours a day, 7 days a week. The house got so huge that it became a mansion. Then, when she ran out of room for building, she tore down sections of the house, just to rebuild them again to keep the construction going! At one point it was 7 stories tall, but during the 1906 earthquake, the highest towers fell over. 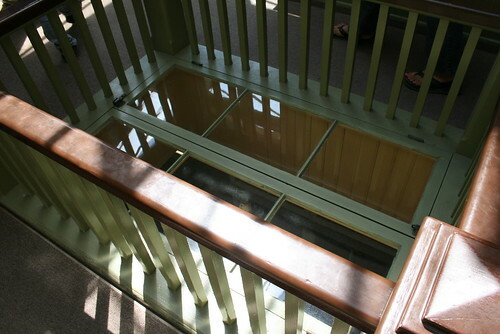 A window in the floor. Maybe it was a skylight? Or maybe she was crazy? The earthquake was really strong, and it even made a fireplace in one of her rooms fall through the floor! 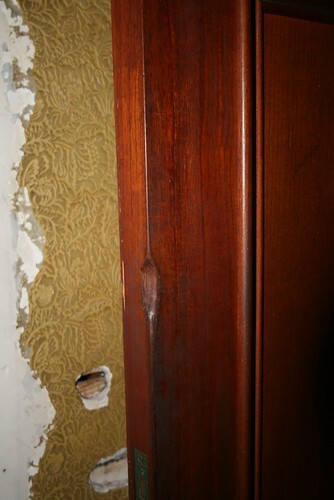 That caused one of the walls to shift, which pinched the door shut and trapped her in the room! The servants took a long time to find her because the house was so huge, but they had to pry the door open with a crow bar. The mark of the crow bar is still on the door. Crow bar mark on the door. After the earthquake, which she thought was some kind of curse (again) for spending so much money on her house, she decided to close off the front, where she spent the most money on, never to be opened again for the rest of her life. She spent a lot of money! She made about $1000 A DAY from stock in the company. She spent about $9000 on a ball room when at the time it cost about $3000 to build a whole average house! She would talk with the spirits every night, and even ring bells in the bell towers at midnight and 2:00am every night. She never took the same path to her bedroom at night, hoping she would confuse the spirits so that they couldn't follow her to sleep! 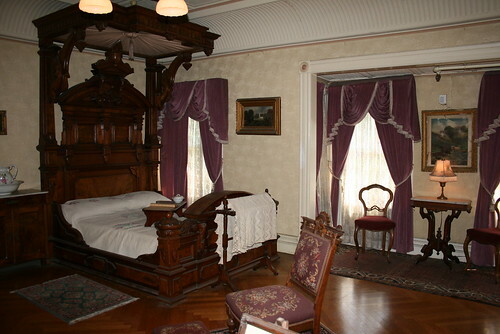 The bedroom Mrs. Winchester died in. Well, she built and built and built until her death. She died in one of her bedrooms in the night. It was a really weird house. After the tour inside, we went outside to visit the gardens. 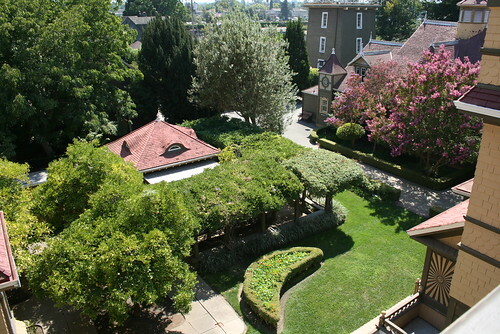 A view of the gardens from the 4th floor. 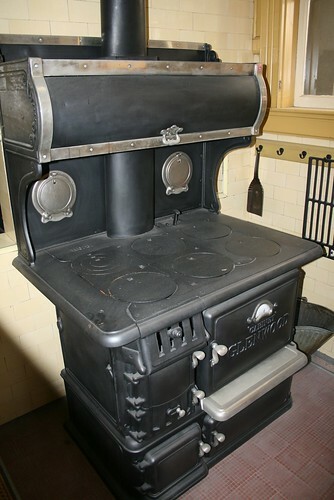 An old wooden stove in the kitchen. 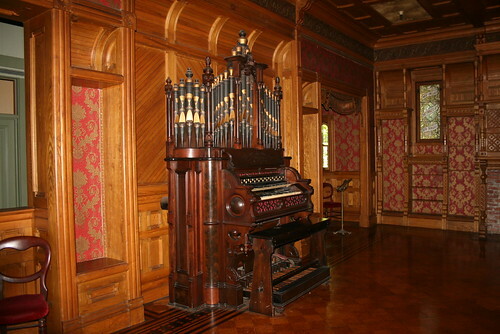 Mrs. Winchester's grand ballroom organ. 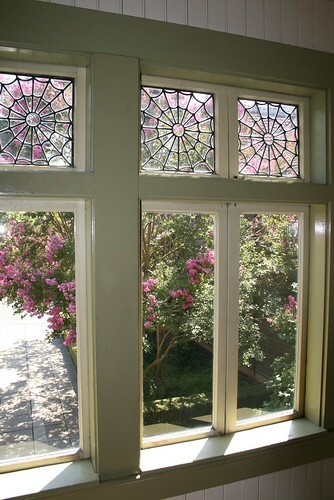 Spiderweb glass windows looking out to the garden. The freakiest picture of them all! Is that a ghost or spirit caught on camera!? Wow! It is really strange how both of us got very similar photos! When I saw your photo it brought me back to that place! 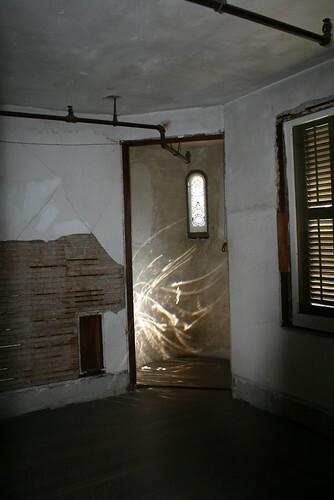 The house was very strange and I don't doubt that there are spirits lurking in there. Great photo! Some people think that its the stained glass windows in the turret but I'm not so convinced on how a stained glass window could make such a reflection like that. It looks like its in motion.